If you're looking for a mild lift to level out the front of your truck, you've come to the right place! Ready Lift leveling kits are an easy solution that are reliable, safe to use, and best of all, maintain factory ride quality, quaranteed. This ReadyLift front leveling kit achieves lift for your truck with a new set of forged torsion keys. Unlike some others, Ready Lift Torsion Keys are designed to grab the FLAT of the torsion bar for a tighter, more secure fit. CNC machined adjustment bolt pockets and superior hardware allow for proper bolt seating, ensuring accurate and safe adjustment. being forged, ReadyLift Torsion keys are over 25% stronger than OEM components, and guaranteed to never break or fail. The part number for this Ready Lift front lift kit is 66-3090 and it fits 2002-2006 Chevy Avalanche (all 6 Lug) models. It lifts the front of your truck up to 2.5" (the amount of lift is adjustable), giving your truck a level stance and allowing you to safely run up to a 33" wheel . 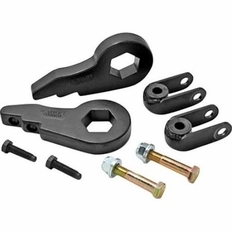 When it comes to safely loading an unloading GM, Ford and Dodge torsion keys, nothing beats ReadyLift�s Professional Grade Torsion Key Removal Tool. Made from forged hardened steel, this tool makes removing and installing torsion keys safe and easier, allowing for adjustment or replacement of GM torsion keys in as little as 15 minutes per truck. The forged and hardened steel used in the construction of this tool has been lab tested for strength and safety and is okay for use with air tools. Can be used with Dodge and Ford trucks. Dodge Trucks require an adapter plate which is included with all Dodge ReadyLift Torsion Key kits.